Paying off your last debt and yelling out “I’m Debt Free! !” Is one of the best feelings in the world. We took a full year and worked as hard as we possibly could to pay off all of our debts. That was over 2 years ago, and it is amazing to look back at our accomplishments. 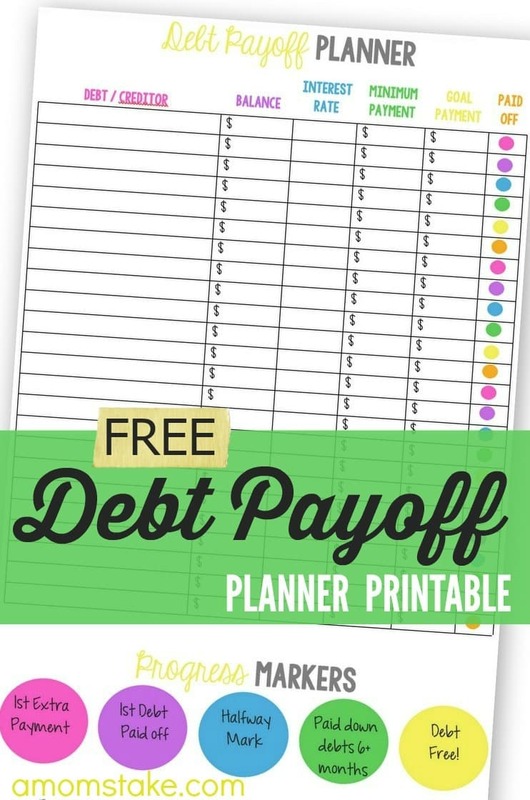 We used a simple spreadsheet just like this debt payoff planner I created back when we were paying and working our way through out debts. Begin by determining in what order you plan to pay off your debts. If you use the Debt Snowball method, you’d begin with your lowest debt balance, regardless of interest rate. This method helps give you a “quick win” when paying off your debts. This is the method we used, and I can attest that those small victories really do matter. We are working on paying off our mortgage, now, and it is much more difficult to have such a big loan payment as we don’t feel the “victory” as we did on our much smaller debts. The other alternative is to order your debts by highest interest rate. Fill in all fields except your “goal payment” field. Only use this field for the debt you are currently tackling with all that you can and pay the minimum payments on all of your other debts. When one is paid in full, you can check the box at the end of the row and move to the next goal payment field for another debt payment. Just for fun, to help you celebrate your victories, there are a few progress markers at the bottom of the debt payoff planner that can be marked off when accomplished. You can download the Debt Payoff Planner with either of the links above or by clicking the image above. The download is available in two format sizes. The link will open up a new tab where you can view the PDF and save or print the file. Print out all the free budgeting worksheets in the series and then get organized with a simple 1-inch binder, dividers, and sheet protectors. These products can help you get started. Two weeks ago we got our account balanced aligned with a Personal Cash Flow Statement. Check back in two weeks for a Weekly Chore Chart printable to get your weekly schedule simplified. Cash Flow Statement – Understand the when behind your bank account balances and bill due dates! Get your home routine set to simplify your daily tasks with this weekly chore chart printable! Hi, Very practical. Timing is good with tax season coming up. Thank you for coming to the Inspire Me Monday Linky party. I’m Janice, one of your hostesses. Love this worksheet! We are just starting a major debt repayment mission, while saving for a new home. This will come in especially handy to me, I am a visual person and I need to see the plans all mapped out to know that we have some hope! Thanks for sharing! Thank you for sharing this great resource. I found you on Fluster Buster. Have a great day! This is exactly what I’ve been looking for! I love the simple layout and cute design. Thanks for offering this – it will definitely be put to good use. This is great! Our only debt right now is our home which we’d love to payoff early! That is handy! We’re very lucky that all of our debt is already paid off. There are so many people out there who just cannot manage their money. This would be a great use for them! This is such a wonderful way to keep track of my spending. I have been trying to cut back, and this will help me a lot. I love this. You really have to stay on top of your finances if you want to avoid surprises! The printable is of the Cash Flow worksheet! I would love the debt payoff planner! thank you for your post! Thank you so much for catching that! I’ve fixed the uploads! 🙂 You may have to hit ctrl+f5 to refresh the file since you’ve clicked the link before to get the right one. This is a great worksheet to keep track of monthly bills and work towards paying off credit card debt. I sure am glad to see you doing this. I think this is super important in our society of living on credit. And the fact fact that you and Dan are actually doing it and living it offers a lot of credibility. Keep up the good work.